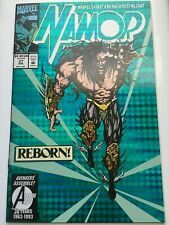 NAMOR : THE SUB-MARINER #37 JAE LEE GREEN FOIL COVER MARVEL 1993 NICE!! Namor Reborn The Sub-Mariner #37 1993 NM 9.4 (foil cover) Marvel comics. Namor! "The Sub Mariner" (Iron Fist) (1992-1993) # 28-29, 37 FN/VF! NAMOR: THE SUB-MARINER #37 - REBORN! Marvel Comics Namor, the Sub-Mariner #37 Modern Age.